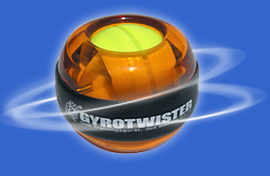 Order your GyroTwister online and save € 4.60 in shipping charges. Autumn orders: We will pay the shipping costs for on-line orders up to 30/11/2004. Additionally save up to € 6.00 on each GyroTwister when you tell your friends and family about this amazing training device. 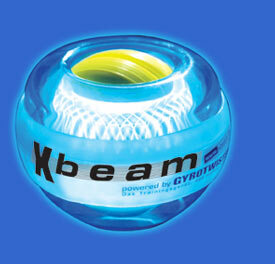 The GyroTwister Classic and the GyroTwister Xbeam comes equipped with a GyroGrip band for better grip at high rotation speeds. All GyroTwisters included a spare starting cord (in case the first cord is lost), a 12-page instruction booklet with training tips and a CD-ROM including RPM gauge software and a 5 minute instructional video. All prices are endprices for shipping within europe. No additional costs are added. Having problems startingup your GyroTwister? Just send us an e-mail or give us a call. We'd be happy to help you. We guarantee you a 14-day return policy for every order. There is no charge should you be unhappy with the product. In addition, you have a 60 month guarantee on every GyroTwister purchased. If you order before 5:00 P.M. your order will be processed and sent out the same day and usually reaches you within 2-3 business-days.